I’m thrilled that Daniel Cruger has started up a blog, Tales from the Tower, where one can find many of the excellent layouts (cities, fortresses, and similar things) that Dan did for ICE’s Middle-earth line of products during the 1990s. 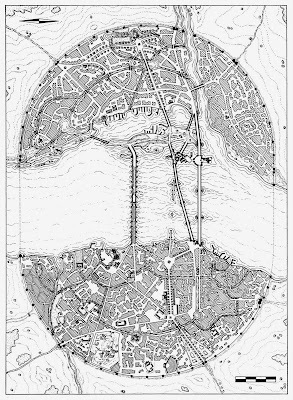 Below is the layout for the city Osgiliath from the magnificent Kin-Strife campaign module (published in 1995). Many other layouts from the Kin-Strife can be found here. Not only are these layouts great for Middle-earth campaigns, but they could easily be used with other fantasy settings as well. I’m looking forward to future posts of Dan’s work over at Tales from the Tower! Accompanying Bōdric, Adralat, and myself was the mighty warrior-slave of Lord Salamir, the remarkable human Myluk. Also joining us were two earnest human slaves expert at handling Melnibonéan ships, such as our sleek hornet barge, the Hot Needle of Inquiry. They were named Ulor and Brax, and seemed wonderfully, hopelessly loyal. On the sixth day since leaving Imrryr our hornet barge entered the bay of Ryfel, which slices into the land where the backward realm of Pikarayd (to which Ryfel belongs) confronts the far more civilized kingdom of Argimiliar. My half-brother, Adralat, Myluk, and I left the hornet barge in a small cove a day’s march north of the city. We instructed Ulor and Brax to guard the ship with their lives in our absence. Given the manifest Melnibonéan design of the Hot Needle of Inquiry, and the fact that Pikarayd languishes under the boot of vile Pan Tang, we thought it best to leave our ship hidden and attempt to infiltrate the city with as little fanfare as possible. I will not squander my limited ink describing our overland journey to the city. Suffice to say that we did not get there until dusk. We managed to convince the city guards – ill kept and badly mannered Pan Tangian cretins – to allow us entry. Ryfel is the most squalid, fetid settlement that I’ve ever had the misfortune of encountering. Ilmar was a perfumed palace constructed by the Eternal Lords of Aesthetics in comparison. The only noteworthy structures were the still impressive remnants of the Bright Empire. (Apparently this horrible little place was once a minor outpost of Melniboné.) The most significant building I spied was the mighty Black Citadel, which was mounted on a severe bluff to the northwest of the city, overlooking miserable Ryfel like a savage black eagle eying its prey. Also worth noting was the octagonal Temple of Chaos. On each point was mounted a statue of a supercilious Lord of Chaos: Mabelode, Slortar, Marthrim, Aesma, Xiombarg, Balaan, Mahluk and Artigkern. Despite my partial Melnibonéan heritage, I have no fondness for the Lords, and hope that we can avoid the grandiose temple during our stay here. Once in the city, we had a brief unfortunate encounter with some drunken city guards in the least squalid part of Ryfel, the “Old Side.” It amuses me to note that poor Bōdric cravenly parted with a hundred of his precious silver coins in order to avoid physical conflict. I would have preferred to have seen them lying in the gutters, their entrails strewn about the street! But I suspect that my half-brother’s course was the wiser. Eventually we found ourselves in a massive quayside inn called the Frozen Gem. A remarkable place, the main floor was a common room filled louts, ne’er-do-wells, and other assorted riff-raff from across the Young Kingdoms in various states of drunkenness. Presiding over it all was an innkeeper, a canny pipe-smoking fellow named Zherez. While we negotiated for a private room for the four us, Zherez kept looking at my half-brother and myself with his beady, suspicious eyes. I suspect that he may have discerned our subtle Melnibonéan features. Not a good thing in a city controlled by the disgusting Pan Tangians! My worries aside, Zherez helpfully informed us of the slave auction taking place in the market square the next day. 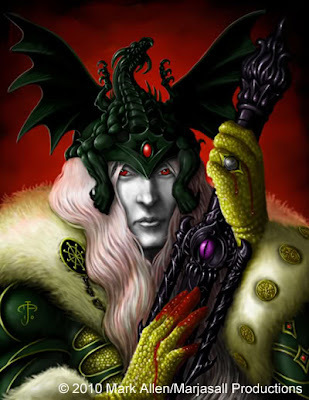 Hopefully we will be able to rescue Lord Salamir and his family then – assuming, of course, that we have not arrived too late! Newt Newport of d101 Games has taken the core Swords and Wizardry rules (the ‘0e retro-clone’), my Akratic Wizardry house rules (which I developed in order to give S&W a stronger ‘swords and sorcery’ character, and used for my 2009 S&W ‘Ilmahal’ campaign), various ideas of his own, Newt’s ‘dying world of Zarth’, and has developed the Crypts and Things FRPG. 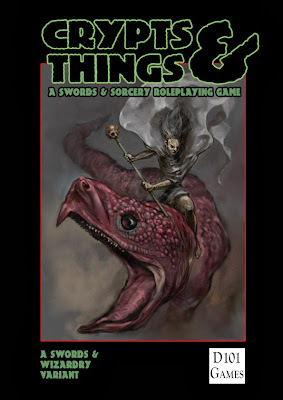 I’m excited that my Akratic Wizardry ideas for S&W will be appearing in a rather slick looking print product (although I’m sure that some of them will be revised before the final version of Crypts of Things is made available). Of course, some of these rules already have appeared in past issues of Fight On! and Knockspell. I’m equally excited to see Newt’s ideas for swords and sorcery gaming, including information on his world of Zarth. Suggestions for Improving This Blog Welcome! I’m off to Chicago and Milwaukee for several days (a mix of work and pleasure), so it’s unlikely that I’ll be able to post anything new until next week. In the meantime, though, I would be grateful for any suggestions that any of you might have for me on how to improve this blog. Can the layout be improved somehow? Any suggestions that any of you might have for ‘upgrading’ Akratic Wizardry would be very much appreciated! Thanks in advance. 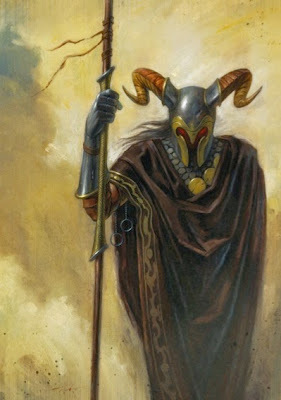 Also, here is a very cool picture of Elric by Mark Allen (a.k.a. ‘Marjasall’) to keep this blog looking good until my return. RPG Now and DriveThru RPG (the same company, but with different websites for some reason) have made it easy to donate to the Red Cross in order to assist their efforts in dealing with the current earthquake and tsunami disaster in Japan. My heart goes out to the people of Japan at this time. The One Ring™, the fantasy roleplaying game set in the world of The Hobbit™ and The Lord of the Rings™ to be released by Cubicle 7 Entertainment in partnership with Sophisticated Games, is one of the most eagerly awaited RPG releases of the year. 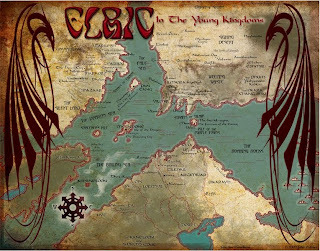 With gamer and fan anticipation growing toward the August 2011 debut, Cubicle 7 today released some details about the format and content of the game line’s first release: The One Ring™: Adventures over the Edge of the Wild. 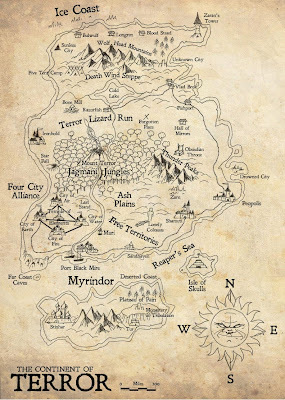 Focusing on the region of Wilderland – from the east of the Misty Mountains through Mirkwood to the Lonely Mountain – the game covers the geography of the region and its major cultures. Immersion in the setting is at the heart of the game. 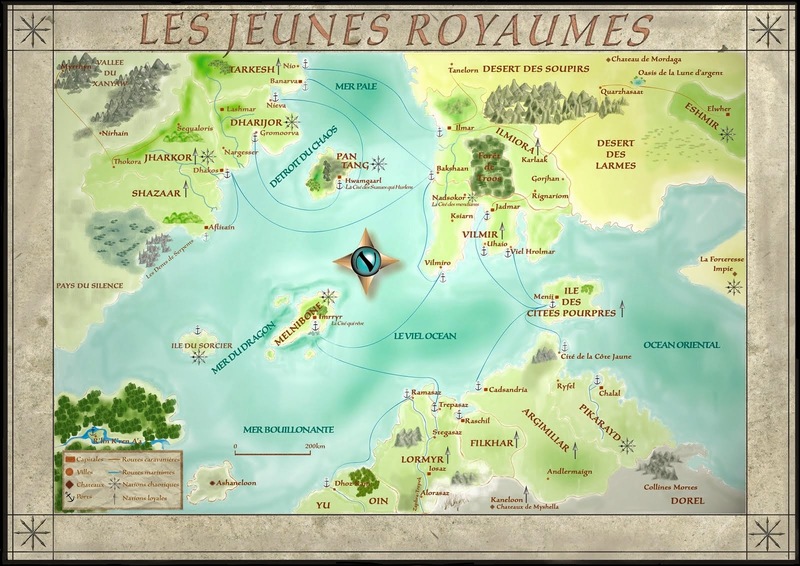 Players create their characters from the cultures of the region, integrating them fully with the setting and giving them a personal stake in the unfolding events. The wood elves of Mirkwood, the dwarves of the Lonely Mountain, the Woodmen of western Mirkwood, the Bardings of Dale, Beornings, or hobbits that have ventured into the region after Bilbo’s return to the Shire, are among the characters featured in the initial release. The pictures in this post are from Cubicle 7, and so may be appearing in the game. 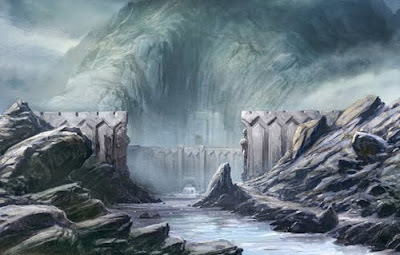 I think that the first one is of Helm’s Deep, and the second of Dol Guldor. As I’ve mentioned in at least one earlier post, I’m a huge fan of maps, and especially fantasy maps. I hope that some of you enjoy looking at them as well. 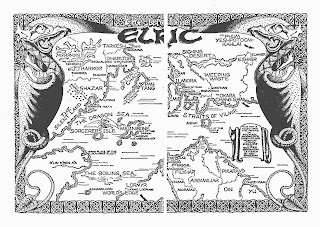 Here are some different maps of Michael Moorcock’s Young Kingdoms world, as described in his various Elric and Rakhir stories. 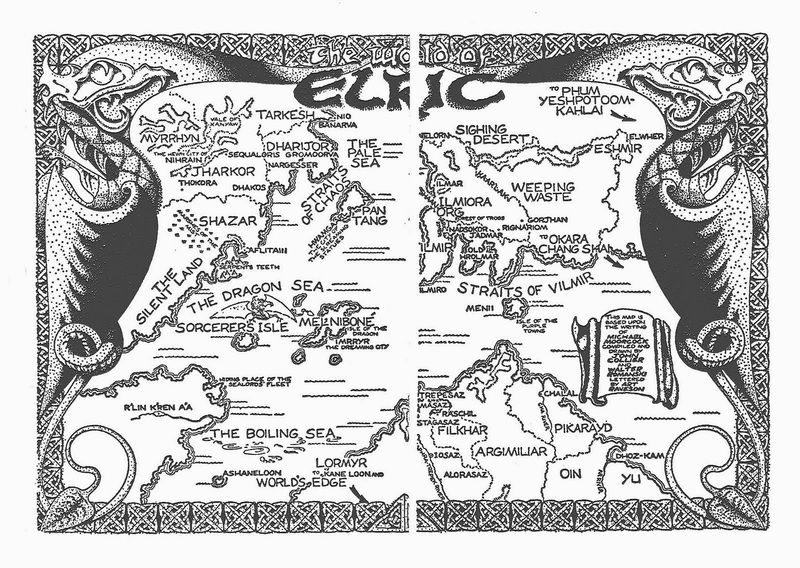 This map, by John Collier and Walter Romanski, was included in some of the Daw editions the Elric stories. 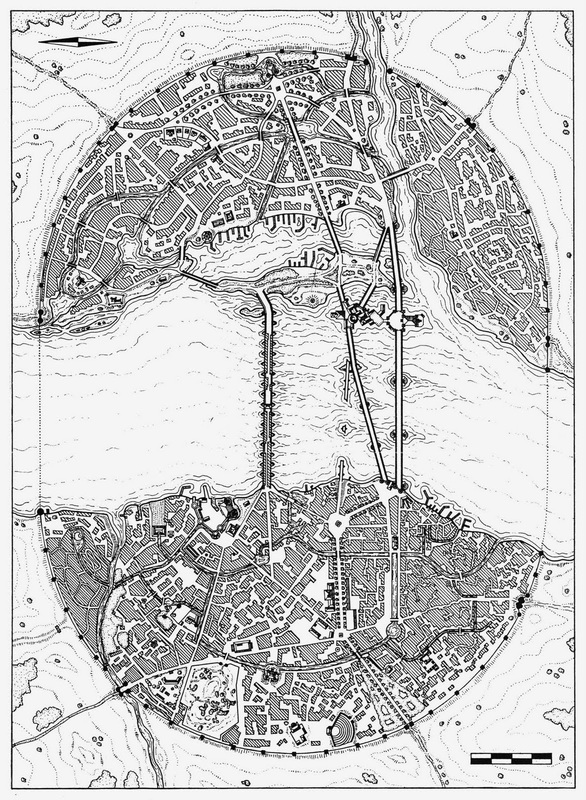 The classical William Church map that appeared in Chaosium's RPG Stormrbinger (editions 1-4). 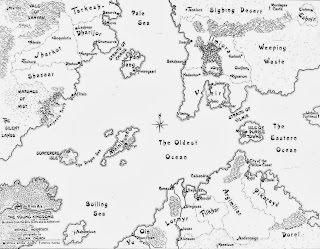 A map by John Collier (an update of the version found in the DAW books). 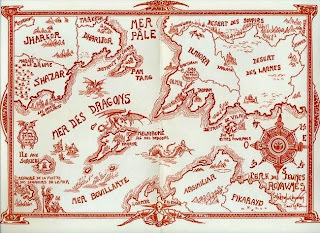 Finally, this very pretty French colour map by an unknown artist. All of the maps posted here were found in this part of the 'Moorcock's Miscellany' website. 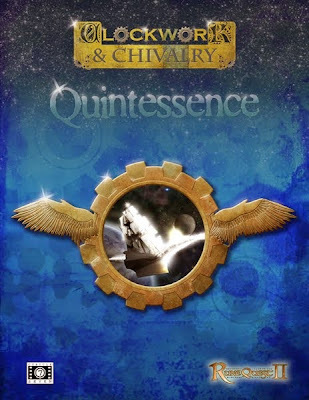 Somehow I missed the news that the fourth instalment of the Clockwork and Chivalry ‘Kingdom & Commonwealth’ campaign for RuneQuest II has been published. It is called Quintessence, and involves a trip to the Moon! I mentioned this adventure a while ago – including correctly guessing that John Wilkins would be the fellow behind the 17th century space programme – so I’m quite eager to get my hands on this book. For those curious, there is a preview of the book in issue 90 of Signs and Portents (available for free here). I’m sure that most readers of this little blog are familiar with 'Grognardia'. But in the unlikely event that you aren’t (or don’t visit it regularly), I thought that I would link to two very good recent reviews posted there. If you don’t own either OQ or MRQII, but are interested in either game (or both), these reviews are well worth reading. Greetings, students, and beware, for you are about to embark on a journey of eldritch erudition, mind-bending mathematics, and scholarship from beyond the pale. First, let me inform you that Mrs. Figgins will not be with us today. The maddening transformation of pallor and physique that culminated in her maternity leave hath subsumed her person wholly and completely. Second, let me also inform you that your usual substitute arithmetic teacher, Mr. McAuliffe will not be with us either. Two days ago, the police, who broke down Mr. McAuliffe's door after complaints from the neighbors of bloodcurdling screams during the night, found a notebook on his kitchen table that seemed to indicate that he had worked out pi to the last place. McAuliffe was nowhere to be found, but the distinct odor of sulfur and the neatly piled stacks of clean, dried animal bones in the corner gave them pause. That, and they found two cats in the microwave, only one of which was partially devoured. The hornet barge was a sleek, stylized vessel carved from the black sabrewood tree native to Imrryr. The entire hull was carved from a single trunk, intricately crafted by Imrryr’s expert slave shipbuilders, and then equipped with two smaller skiffs that slotted into berths on the starboard side of the ship. The whole vessel was shaped to resemble the dragon hornet; a six-winged insect unique to Melniboné that proliferated in the north of the island during the balmy summer months. Few ships of this style had ever been built and it was possible that Lord Salamir’s Hornet Barge was many centuries old. Slaves laboured through the night to repair the ship and outfit it for its next voyage to Ryfel. The mast was repaired and damaged portions of the two decks replaced. Time precluded the craftsmen from using sabrewood and so panels of stout oak were used instead, the dark brown of the wood contrasting sharply with the ebony of the original timber. “Hot Needle of Inquiry.” Bōdric said after deliberating for some time. Edvund smiled; trust his brother to want to name a ship after a notorious implement of torture. “A waste of good wine, if you ask me,” Adralat muttered. “No one did, human.” Edvund said. Adralat simply smiled and shrugged. “One thing though, Bōdric.” Bōdric scowled. “A fair point.” Edvund conceded. They watched the remaining preparations together in silence. The slaves brought aboard food and clothing of the coarse type favored by the humans of the southern continent. Finally the sail was fitted to the newly repaired mast and the overseer in charge of the outfitting approached them. “The ship is ready my Lords,” he said. “All is equipped as His Serene Highness Prince Quire requested.” Edvund nodded his acceptance and the overseer departed, leading away his team of slaves. 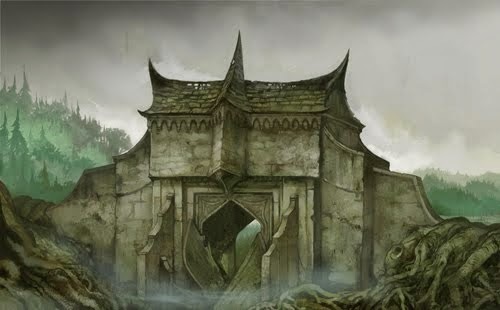 Something cause Adralat to glance around and his eye was drawn to a slender tower, built to resemble the curving tusk of a great mastodon, not far from where they stood. Half way up the graceful spire was a balcony and on it, watching the preparations, were the Empress Sathril and her consort, Prince Quire. Bōdric noticed the staring Adralat and followed his gaze. “In Slortar’s name Adralat, avert your eyes!” He snapped. Adralat dropped his head. “And you called me impertinent,” Adralat whispered. Bōdric did not hear him. Adralat looked up. “Through dreams?” He asked. Edvund nodded. “Fascinating. It must be that dream magic is understood by your people.” Edvund laughed. “Oh my dear, poor, uncultured friend. Our people are the masters of all magic. Why, we have forgotten more about magic than most cultures will ever know.” Adralat ignored the condescension. “Have you ever experienced these dream couches?” He asked the brothers. The two Melnibonéans exchanged amused glances. “You really are the strangest example of a human I’ve ever come across,” Edvund said. “I take that as a compliment,” Adralat replied, and offered a mock bow. “She’s gone.” Bōdric added and glanced towards the balcony. Only Prince Quire remained; he was watching the three on the quay intently. Then, he nodded, as though giving assent for something and disappeared into the tower. And so the three collected their belongings from the waiting slaves. 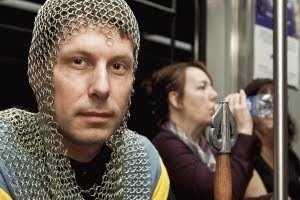 Myluk joined them onboard and busied himself by instructing the other slaves in the ways of the Hot Needle of Inquiry. The steersman and Myluk dropped the sail and prepared to be blindfolded as a Sea Maze Navigator came aboard to take the ship through the treacherous labyrinth protecting Imrryr, and out to the open ocean. Below decks, the three fastened their blindfolds across their eyes. “What will we find in Ryfel, I wonder?” Edvund said. “Only the Lords of Chaos know,” Bōdric replied, “and I’m willing to bet drinking money that if Pan Tang runs Ryfel, they won’t be far away.” Silence descended across the Hot Needle of Inquiry as the boat slid into the cavernous tunnels of the Sea Maze, the only sounds being from the oars of the pilot tug boat and the terse instructions of the Sea Maze navigator. Bōdric and I reeked of salt water and countless days of uncomfortably close proximity with humans. Consequently, before our audience with Empress Sathril, we were bathed with hot water and scented oils, and clothed with magnificent perfumed silken garments. I almost felt like my old self again. Alas, there was no time to rest and enjoy our improved condition. We were ushered before the Empress straightaway. The unearthly beauty of Her Most Serene Highness, the Empress Sathril the Eighth, Queen of All Worlds, surpassed even the brilliance of the Ruby Throne on which she sat. We were careful to avert our eyes from her angelic face until she permitted it. Even so, my half-brother could not gaze upon her for more than a few seconds, tears threatening to stream from his awestruck eyes. Although I too was impressed by her exquisite beauty and grace, my entrenched ambivalence toward all Melnibonéan authority thankfully shielded me from similarly being besotted. In addition, my suspicious grey eyes spied a brooding figure by her side, no doubt her chief advisor, First-Husband-Concubine, Prince Quire. It is difficult for me to recall the interview with the Empress. I felt dizzy with anxiety the entire time, constantly worried that I might commit some inexcusable faux pas. Her voice sounded like heavenly music to me, sweet wine for the ears, whereas my words seemed like cracking glass. In response to her queries, I related to her, as best I could, the tale of the fall of the House Yrvim, including the ancient and once-mighty Palace of Yr. 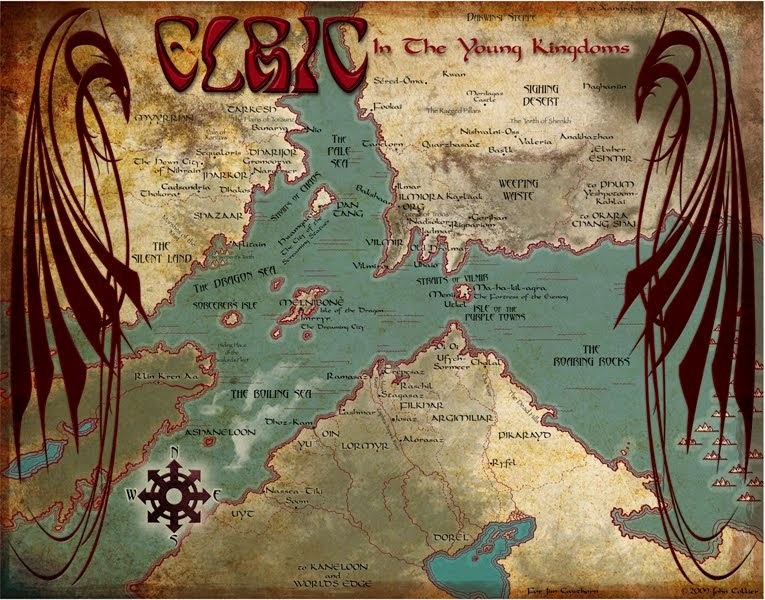 I reported the death of my half-brother (and heir to the Yrvim demesne and other properties) Carac, in combat with the Mereghn assassins and their mercenaries. Drawing on what Bōdric had told me before we left Ilmar, I stated that High Lord Serec Yrvim was still alive when last seen, but in mortal peril. (I refrained from pronouncing my sincere hope that my accursed father had in fact met his justly deserved doom!) Finally, I conveyed the fate of the House Salamir, as related to me by the warrior-slave Myluk. Strangely, the collapse of Melnibonéan power on two continents seemed to trouble the Empress little. She did seem quite distressed, however, at the fate of House Salamir, and in particular Lord Salamir’s daughter, Coru-Dro. I assured the Empress that my half-brother Bōdric and I would do everything we could to recover the members of House Salamir, that we were determined to travel to Ryfel and save the Melnibonéan noble family from the indignity of the slave market. She seemed pleased at my words, strangely emphasizing the importance of saving Coru-Dro above all others. Much of the rest of the audience is a blur to me now. I do not believe that it lasted very long. Subsequently, Bōdric and I were escorted to the Yrvim apartments in the city. I had been hoping to relax and enjoy a glass of rare yellow wine before preparing for our travels, but we were interrupted mere moments later by a royal messenger. It seemed that Prince Quire had come to our apartments in order to discuss certain matters! My half-brother and I welcomed the Prince as best we could, our skills at royal courtesy somewhat rusty from lack of use. Quire, however, did not notice, as he was interested only in some frank discussion. He pressed us on our plans for rescuing House Salamir, and emphasized the importance of rescuing Lord Salamir unharmed. I ascertained an agenda somewhat different from that of the Empress. Whereas the Empress seemed to prioritize the return of Coru-Dro, the Prince stressed the primacy of the Lord’s safety. And with that, Prince Quire departed without a further word. My half-brother and I busied ourselves preparing for our upcoming voyage. After a few hours, much to my astonishment, Adralat was brought to our quarters. It was a most unusual event, to have a (non-enslaved) human brought into Imrryr proper! 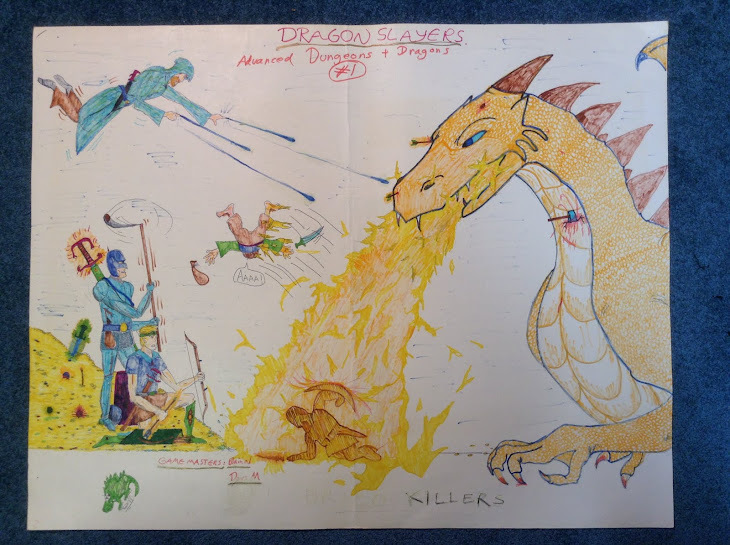 Because of my current gaming activities (namely, running Call of Cthulhu, and playing RuneQuest II and OpenQuest), I haven't been writing that much in recent months about the game that first motivated me to start this blog, Swords and Wizardry (the '0e D&D retro-clone'). This is not because I've lost interest in S&W. It remains my preferred version of Ye Olde Game. Indeed, some of my S&W house rules might be finding their way into a proper 'published' product soon (and some already have been published in past issues of Knockspell). So, in order to counteract weeks of neglect, here are two pieces of Swords & Wizardry news. 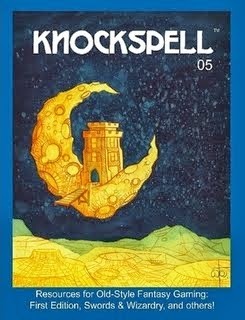 First, Knockspell number 5 (cover shown above) is now available in PDF and print. Second, Mythmere (a.k.a. 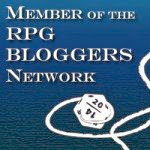 Matt Finch), author of Swords and Wizardry (and, more generally, the instigator of the entire 'retro-clone' movement), now has a blog entitled, appropriately enough, 'Mythmere's Blog'. I look forward to following Mythmere's posts in the future! The list of H. P.' s most used words in his 'Yog-Sothothery' stories can be found here. I was surprised to learn that "eldritch" was used only 23 times. And "squamous" was used only once!